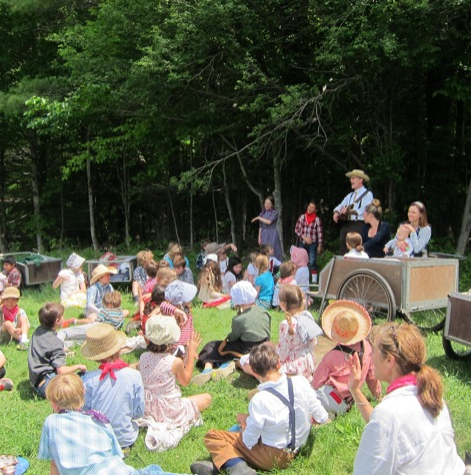 In third grade students leave the hardscrabble life of Norwich for the promise of the west, and become pioneers on the Oregon Trail for the day. Each wagon load of children pushes, pulls or carries their own covered wagon (garden cart) loaded with provisions and one ailing body on the Oregon Trail (Milt Frye Nature Area) all the way to Oregon (the field above the apple orchard). It is our hope that the natural obstacles, the roots, the rocks, the ups and downs, getting the heavy cart from one place to another, as well as the challenge of working together toward a common goal, will provide an experience that may allow the children an understanding of the courage and determination of the early pioneers. The weather only adds to the experience. Children dress the part and upon their arrival a fire is prepared and a meal is cooked. The class sings traditional pioneer songs, plays traditional games, and make a toy.